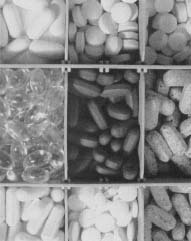 Assorted vitamin pills. Only tiny amounts of each of the 3 vitamins are needed to ensure metabolism, but these minimum amounts are absolutely essential. about vitamin A. They now know that this once-mysterious compound is essential for normal growth and development, maintaining the body's skin cells, and forming part of the two pigments needed by the retina to help the eye adjust to varying degrees of light. By 1906 English biochemist Frederick Gowland Hopkins (1861-1947) was looking into what he termed "accessory food factors." But the scientific community generally believed that all dietary needs could be met by proper amounts of carbohydrates, proteins, fats, minerals, and water. The concept of trace nutrients was largely unknown. In 1907 Elmer McCollum joined the University of Wisconsin as an instructor. Born and raised in Kansas, McCollum had recently received his doctorate from Yale University. McCollum originally studied inorganic chemistry, but had switched to biochemistry simply because no position was immediately available in his chosen field. Biochemistry was known as agricultural chemistry at the turn of the century. The first research project McCollum was assigned to was to study the effects of different single-grain diets on dairy cattle. It was assumed that the three chemically similar grains would have similar dietary effects. To the research team's surprise, however, only the corn-fed cows remained healthy. Those animals that were fed wheat or oats did not thrive. McCollum was immediately intrigued. He reasoned that there must be some undiscovered difference in the structures of the similar foods. Before long, McCollum was designing his own nutritional studies. Because he felt that dairy cattle were too cumbersome to work with, he set up a colony of albino rats. This was the country's first such colony devoted to experimental research. McCollum was assisted in his work by Marguerite Davis, a recent University of Wisconsin graduate. It was in his own laboratory that the studies began that would make him famous. By 1913 McCollum reported that when laboratory rats were put on diets in which lard or olive oil was the only source of fat they eventually stopped growing. These same rats, however, quickly resumed normal growth when fed extracts of eggs or butter. McCollum concluded that butterfat and egg yolks must contain some growth-promoting factor missing in other fats. Within two years, McCollum had isolated the growth-promoting factor. He named it "fat-soluble A" to distinguish it from a water-soluble factor. The water-soluble factor was previously discovered in rice polishings by Christiaan Eijkman (1858-1930). McCollum termed Eijkman's discovery "water-soluble B." Fat-soluble A was soon known as vitamin A, the first vitamin actually to be named and described.